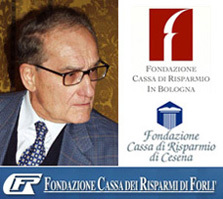 The Leonardo Melandri Program is funded by generous grants from the Fondazione Cassa di Risparmio in Bologna, Fondazione Cassa dei Risparmi di Forlì and the Fondazione Cassa di Risparmio di Cesena. The program is in memory of the late Senator Leonardo Melandri whose encouragement and support have been fundamental for making BiCi a reality. This fellowship program will help strengthen the spectrum of BiCi events and facilitate their attendance by needy students and scholars. The motto of the program is embodied in the Bertinoro Castle itself: an ancient building turned into a modern facility where cutting-edge computer science research events take place.